These spectacular Christmas ecards for business offer magic, sparkle and wonder to surely put everyone into the Christmas Spirit! 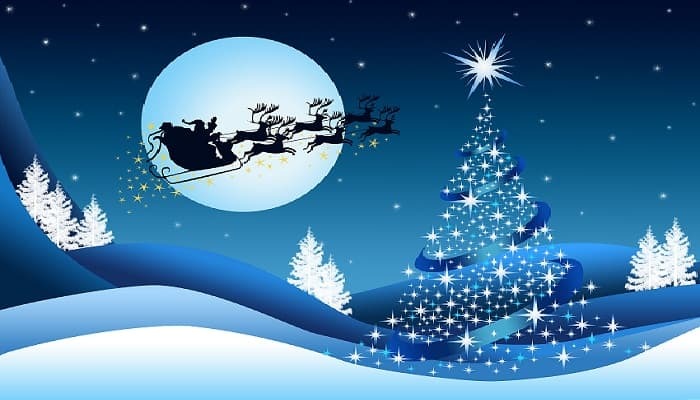 How could it not, with the midnight blue blanket of star filling the night sky, outlining a stunning silhouette of the one and only Santa with his reindeers pulling the sleigh against a perfect full moon! The stunning white trees in the background add a touch of style along with the exceptionally pretty tree of lights which showcase the front of the image. The lights on this sensational Christmas tree sparkle and dazzle as the card plays and truly capture this magical time of year, whatever age you may be! The wonder of Christmas all captured into one beautiful shot! At Ecard Shack, we pride ourselves on the best quality of images, exceptional animation and unique style, providing you with the best service possible for your corporate holiday ecards experience. Why not visit our website today and register an account with us completely free of charge. This will allow you to create your own account with us and design as many cards as you like, with so much variety to choose from. Our extensive range have so many images, sure to suite everybody’s taste. Whilst designing your cards, if you require any assistance whatsoever we are always here to assist you in any way we can. Feel free to contact us at any time this holiday season.